Hiding messy cables can be accomplished in many ways, from inexpensive plastic covers, to cramming wires into cracks and crevices in the floor and walls. These are stopgap measures that should be considered temporary at best, since there are far more organized and aesthetically pleasing options for routing cables. In many cases, simply hiding cables is fine. 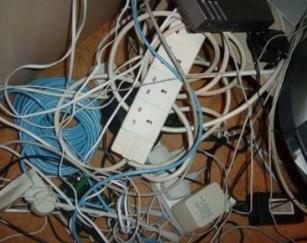 If you are doing this for a residential application, few people will ever see your cable organizers running across the floor or up a wall. In a commercial or professional setting, however, the overall look and feel of your space as seen by your customers (and employees) can say a lot about your company. Not to mention, some solutions for "hiding" cables can be tripping hazards. If you manage an office building, call center, command or dispatch center or a trading floor, you should look for a more robust, refined and flexible cable management solution. If you are looking for a professional, organized and safer solution for hiding your cables, take a look at cable management. We recommend 3 methods of cable management: Overhead cable management, Intra-furniture cable management, and Underfloor cable management. Each of these three methods get your cables and wires out of traffic areas where they may be a tripping or shock hazard to employees and visitors. In overhead cable management, cable trays or raceways are installed which support your wires near the ceiling. This is especially useful in industrial or production environments. The cable trays are mounted using vertical and horizontal supports suspended from the walls or ceiling. In an electrical, telecomm or server room, this solution is very useful and common. It simply doesn't mesh well with many finished interior designs, though. In a work environment, you need to get the cables out of the line of sight, which means you'll beed another system. Some furniture manufacturers offer built in channels which allow routing of cables and wires, keeping them off of the floor and off of the work surface. This is a very neat and clean method of running cables around the workstation. Many cable chaseways are 4"-6" in width, allowing plenty of space for all types of wires and cables. The challenge is, however, you still need a good way of running your cables to your workstations! As the size of your office or command center increases, the more cables you will have and the longer the distances they will need to be run. MonMan partners with top tier console and workstation providers to help integrate cable management throughout the work environment. Contact us for information on work consoles. Finally, underfloor cable management provides a method of routing cables within the floor surface itself, which can then be finished off with options like: wood, marble, terrazzo, tile or carpet. 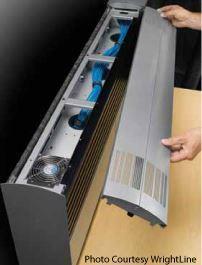 A modular, easy to install cable floor will help hide your cables by using integrated cable raceways. Whether your need to hide cables for a small 200 sq. ft. office, or a large 20,000 sq. ft. call center, you can be sure your cables are easily managed and effectively routed. For a more in depth comparison of true cable management options, check out this blog post.